A homemade card has to be one of the most sentimental and special keepsakes you can ever give. 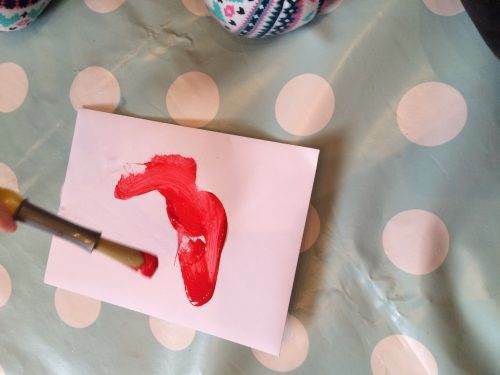 Valentines day is the Bostik Blogger theme for this month so I thought what better time than now to show you how to make a beautiful homemade card. The beauty of this card is that it is so simple it can be made by all ages so it makes it an ideal homemade card for valentines day or any other occasion! This homemade card is really quick and easy to make; it took us less than 15 minutes to decorate the card and the envelope. It is Mr H’s birthday on Thursday so Miss H has declared this is a birthday card not a valentines card! The beauty is, it can be either! Lightly draw a heart on your card. Dip your finger into the red paint and then finger print inside the whole of the heart. Try and keep your finger prints as near to the drawing lines as you can without going over the lines; this will give you a great finger print heart shape. 2. Add Stickers to the card. Obviously you can add whatever stickers and gems you like, we chose heart stickers! 3. Using the Bostik Glue dots add some gems to the card. Simply peel a glue dot and add it to the back of the gem. 4. Next we aka Miss H decided to paint the envelope for an extra personal touch. This is a heart too (I think it is quite good artwork for a 2 year old!). If you enjoyed this simple way to make a Homemade Card. Make sure you follow me on Pinterest so you don’t miss our next craft updates! Check out our other Bostik Blogger post for this month to see How To Make A Heart Garland & Decorate A Bag.